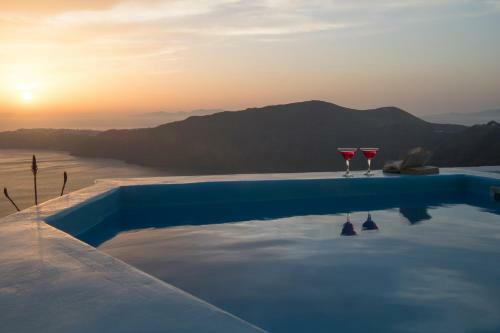 Featuring a pool with Caldera view, Gizis Exclusive enjoys a prime location on the cliff of Imerovigli. It offers accommodation with free public WiFi and free parking. The traditionally styled rooms and suites offer a private balcony where you can enjoy beautiful views of the caldera and the sunset. In-room equipment includes a satellite TV and a hairdryer. Guests can take breakfast by the poolside, or relax on the terrace and enjoy uninterrupted views of the sea and the Caldera. Gizis Exclusive is situated on the main road from Fira to Oia, allowing easy access by car to these villages. There is also a bus stop, just 50 metres away. This triple room features a balcony, cable TV and air conditioning. This suite has a hot tub, seating area and sea view. This family room features a balcony, sea view and air conditioning. This suite has a satellite TV, minibar and seating area. Storno podmínky: Pokud bude rezervace stornována do 14 dní před datem příjezdu, žádný poplatek nebude účtován. Pokud bude rezervace stornována nebo změněna později, první noc(i) bude účtován/a/o.